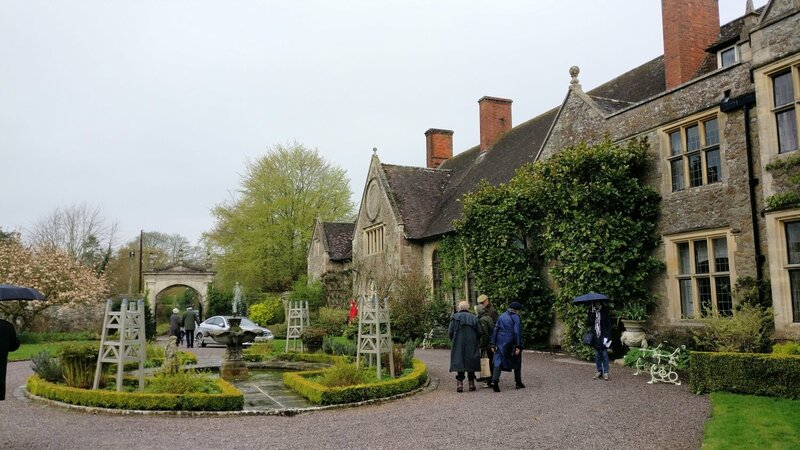 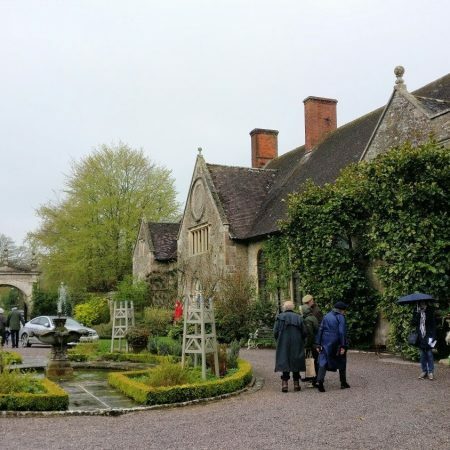 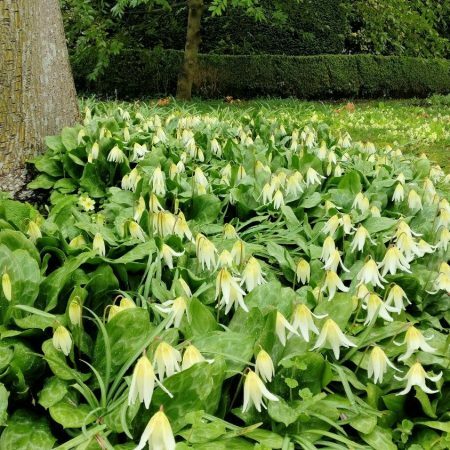 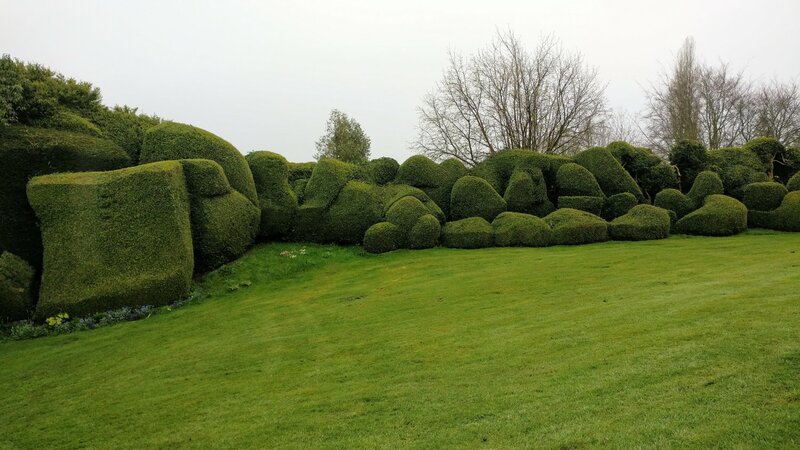 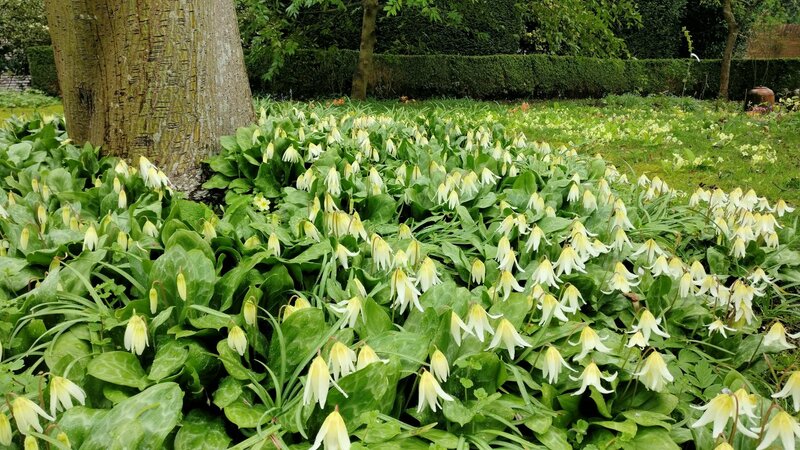 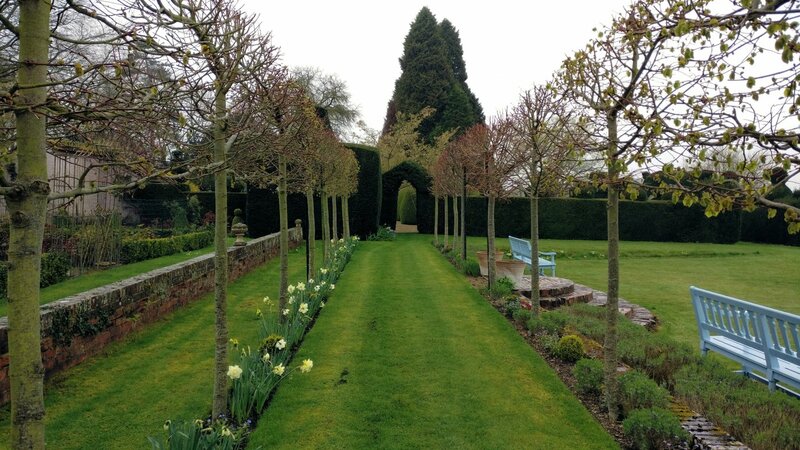 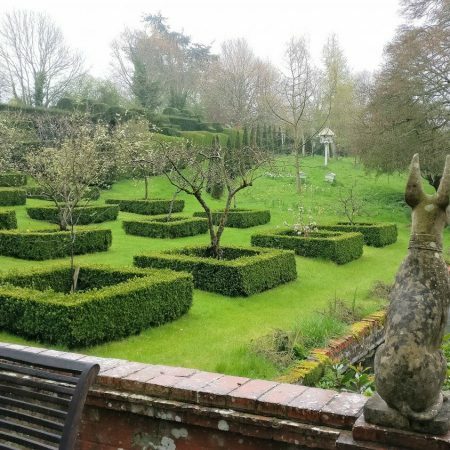 The first stop on our visit to a rather damp Wiltshire was, EBTS UK member Lady Nutting’s own garden in Great Cheverell. 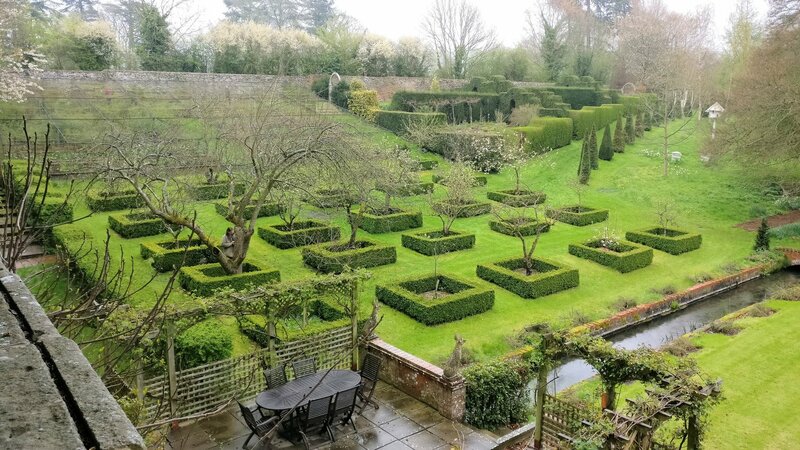 On arrival we had a lovely hot cup of tea before touring the garden, which has a brilliant selection of topiary including an ancient clouded box hedge, amazing yew and a beautiful seating areas with tulips in full bloom bringing a smile to everyone’s faces despite the weather. 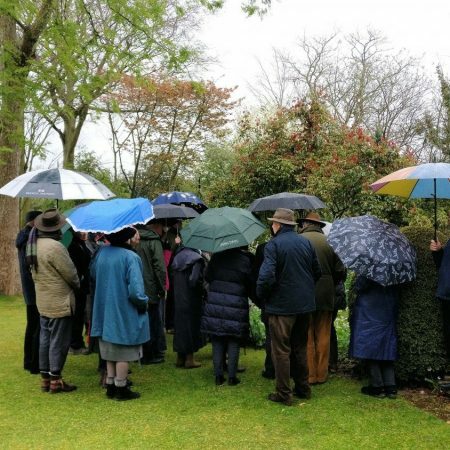 Lady Nutting and Sean her gardener explained how the garden had developed and the work that had been done to combat blight in the box hedging and topiary. 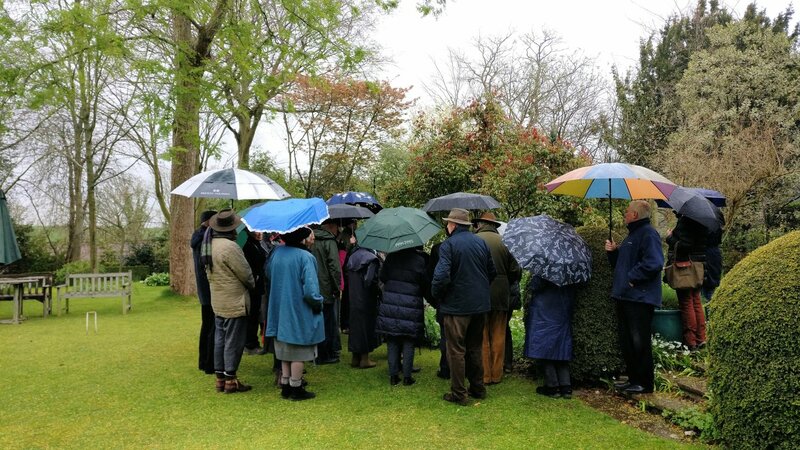 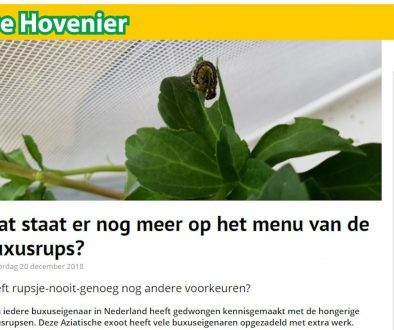 So far the caterpillar and moth have only been present in very limited numbers and advice was given on how to prepare & deal with a potential infestation. 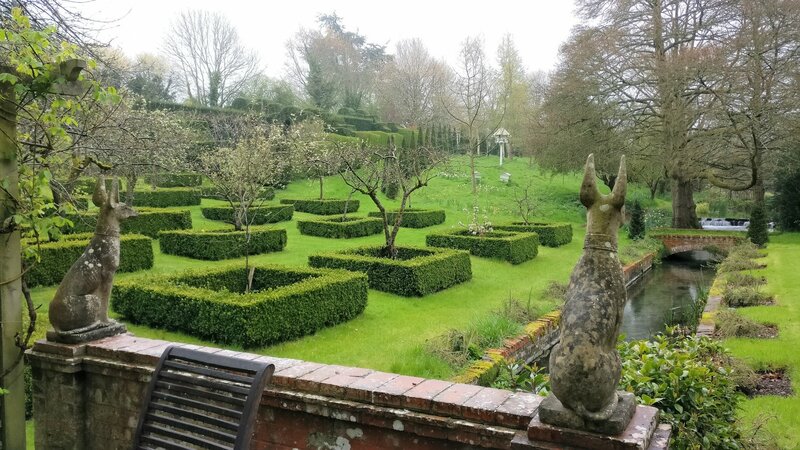 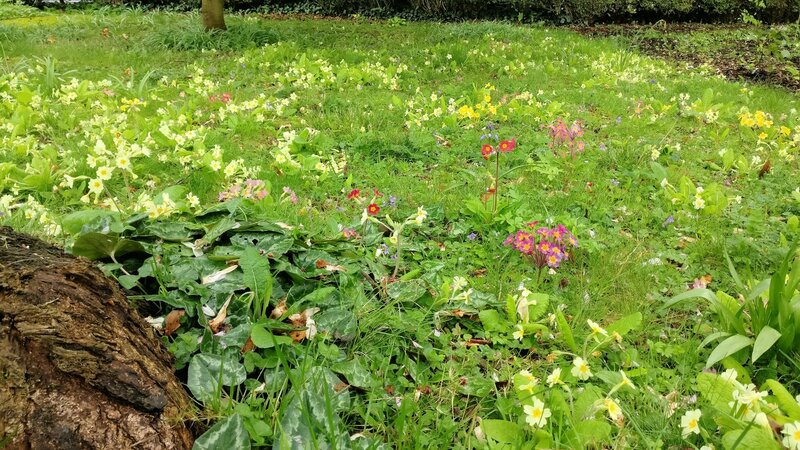 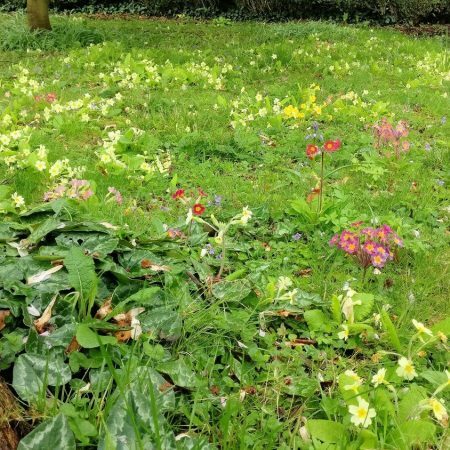 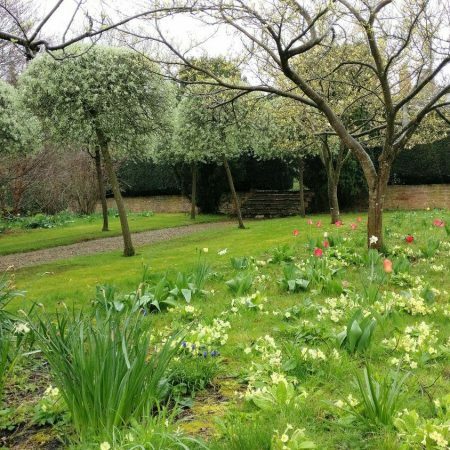 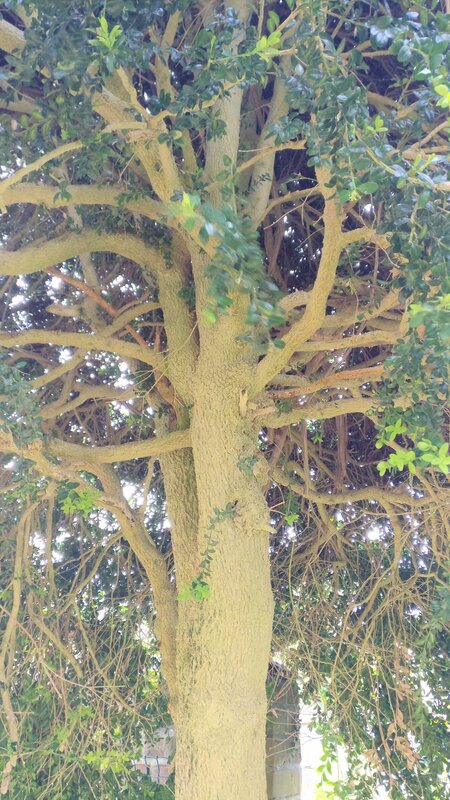 The second garden was at West Lavington Manor. 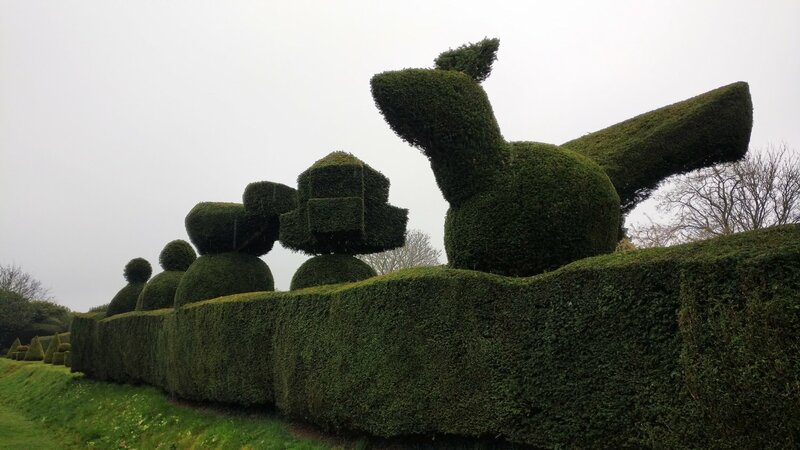 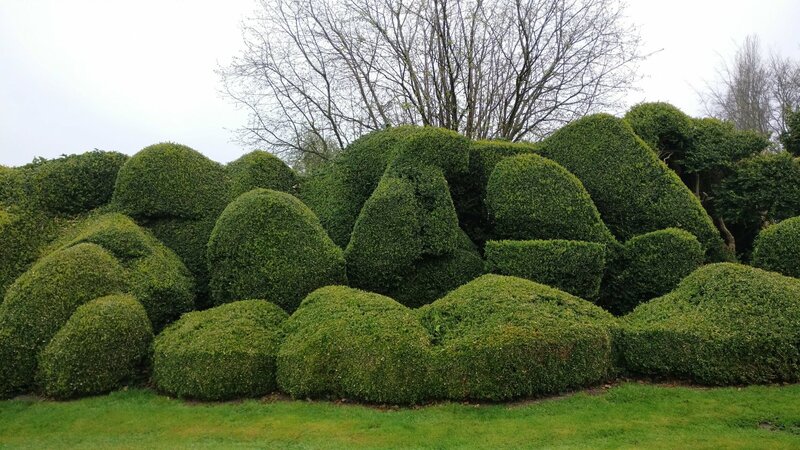 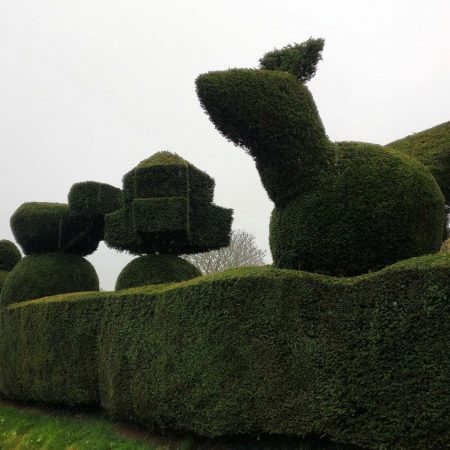 This comprises five acres of topiary, shrubs and a Japanese garden. 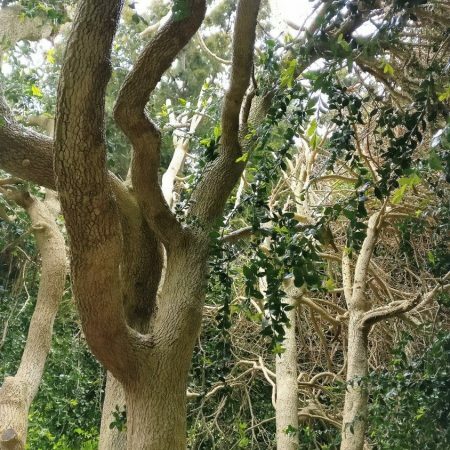 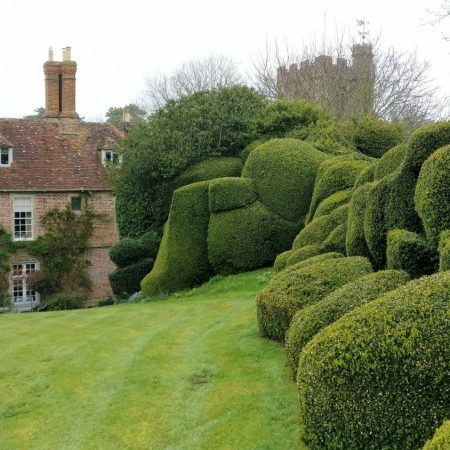 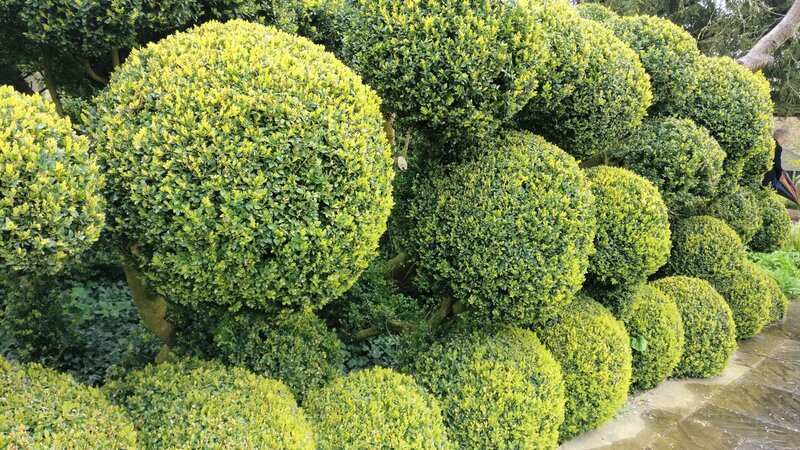 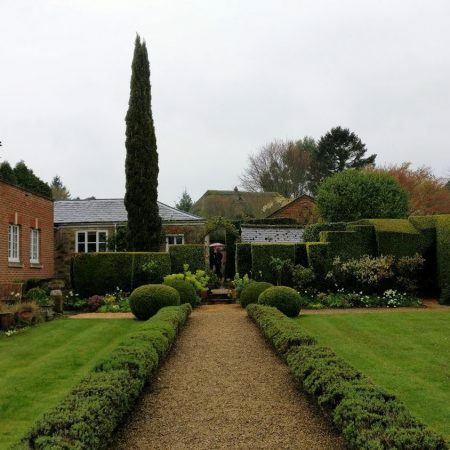 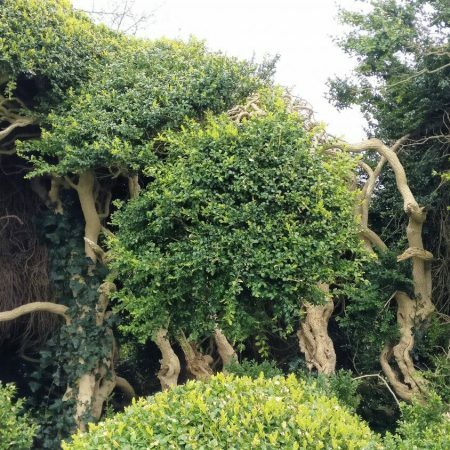 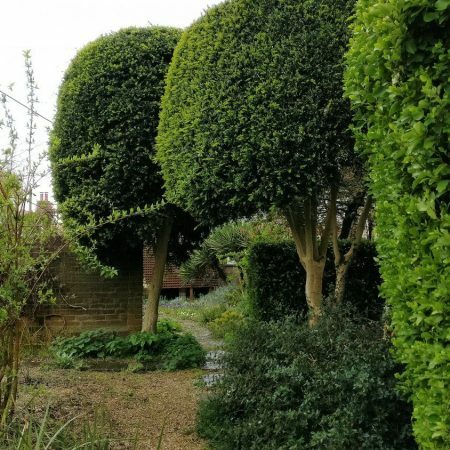 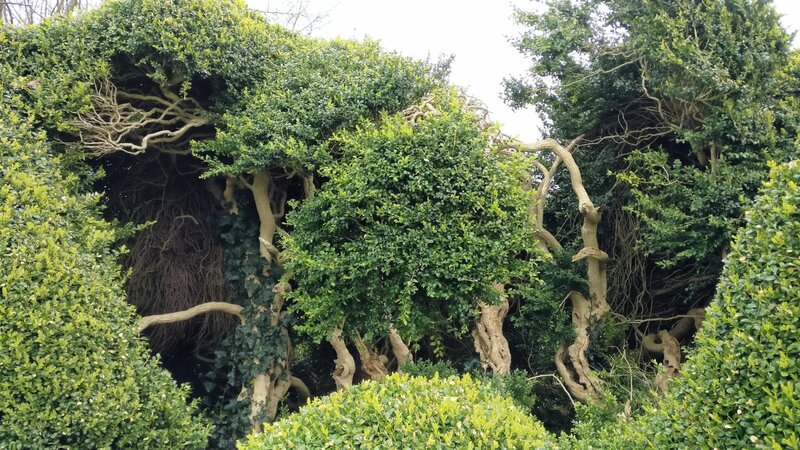 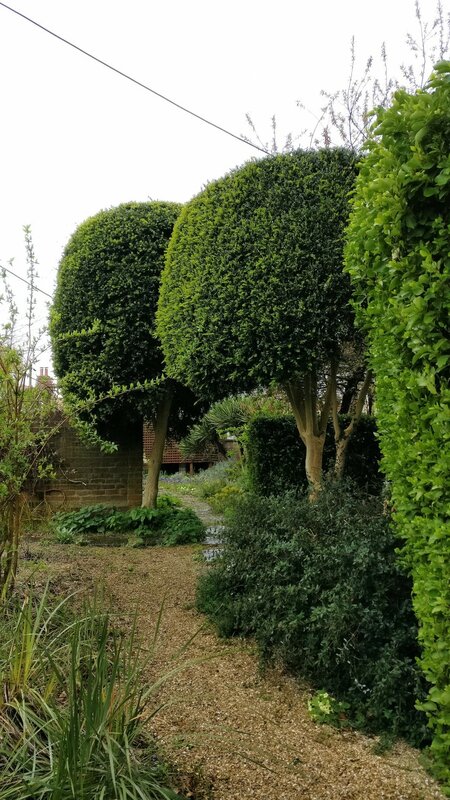 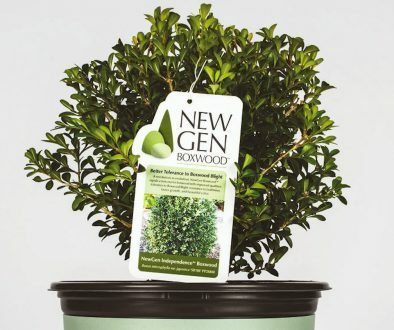 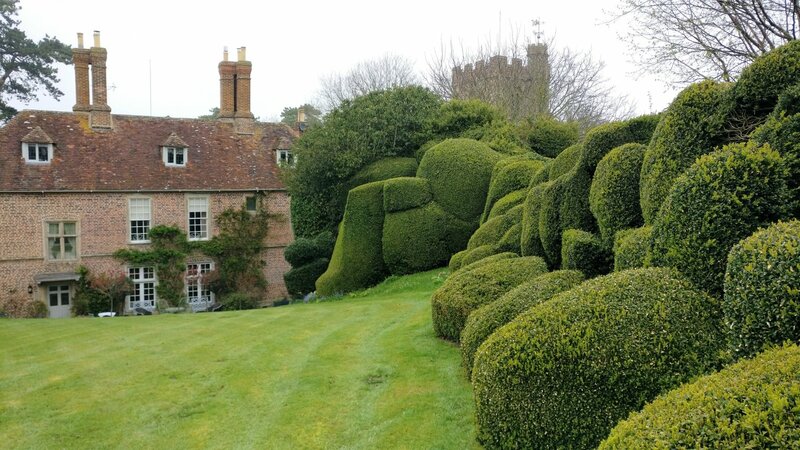 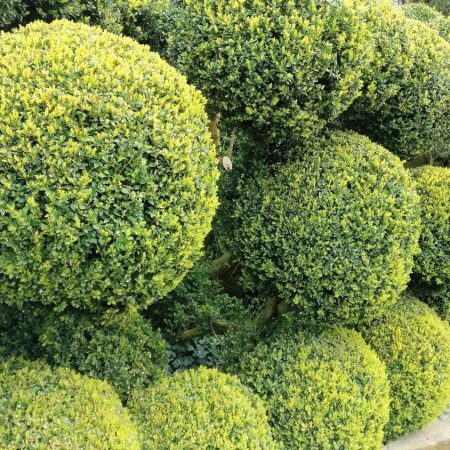 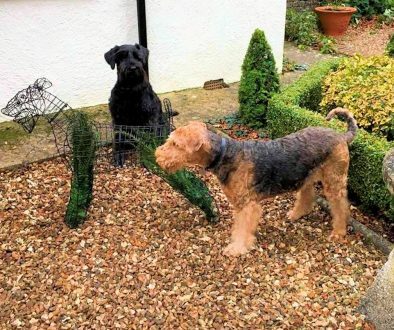 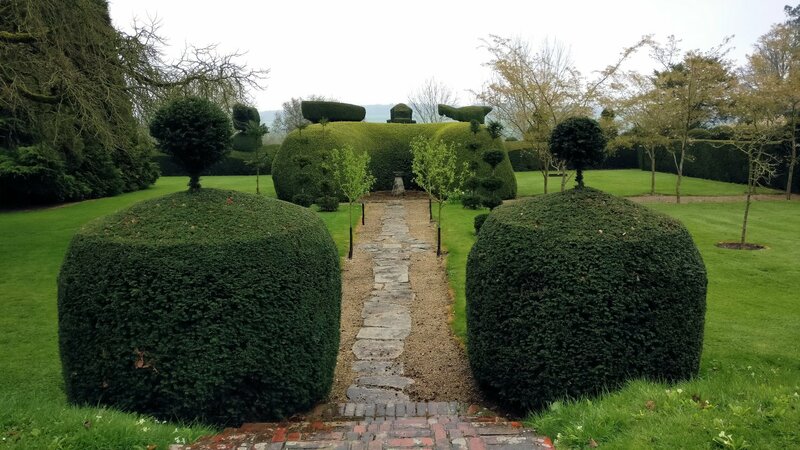 The topiary has been restored over the last three years by the head gardener with assistance, three times a year, from EBTS UK member James Crebbin-Bailey who has introduced a regime based on Topbuxus which is helping bring back to health some badly blighted hedging. 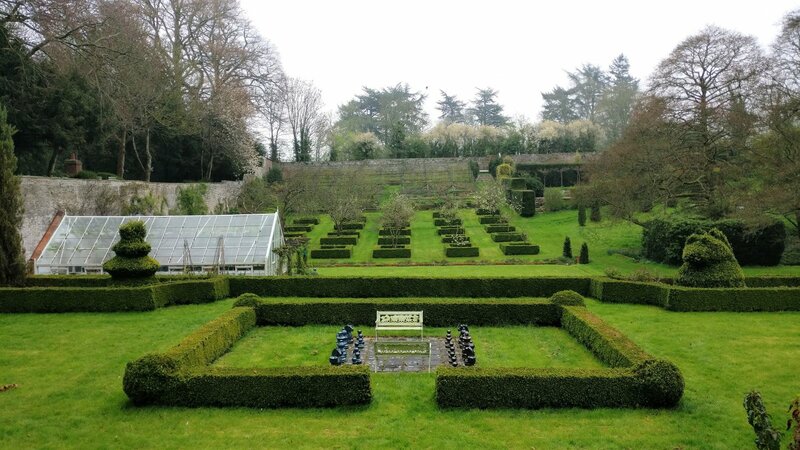 After lunch at The Three Daggers, Edington we visited John d’Arcy’s garden in The Old Vicarage at Edington. 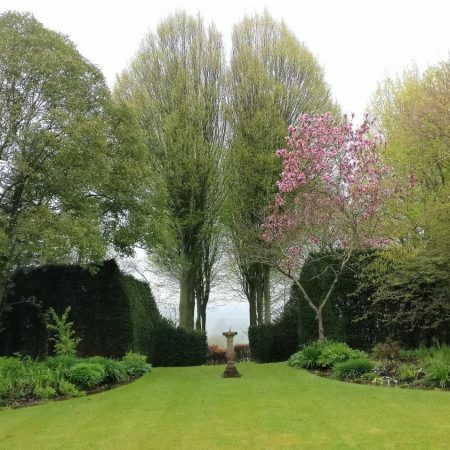 John is an extremely knowledgeable plants man with a garden designed to show off both the wonderful view across the valley it is situated on the side of, and also his amazing plant collection. 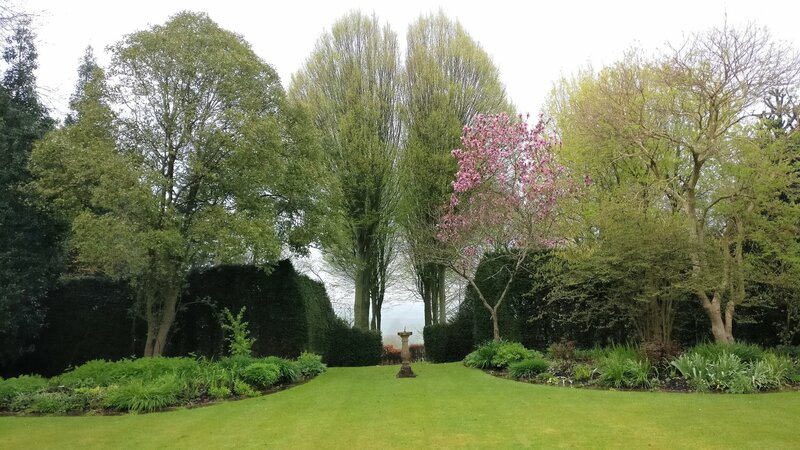 For our fourth and final garden we were very lucky to visit Janey Ewart’s garden which was specially opened for EBTS, for which we are most grateful. 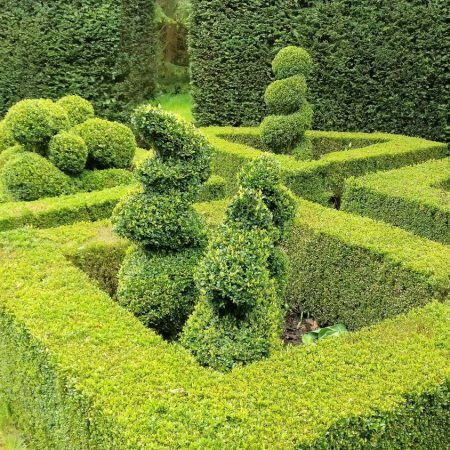 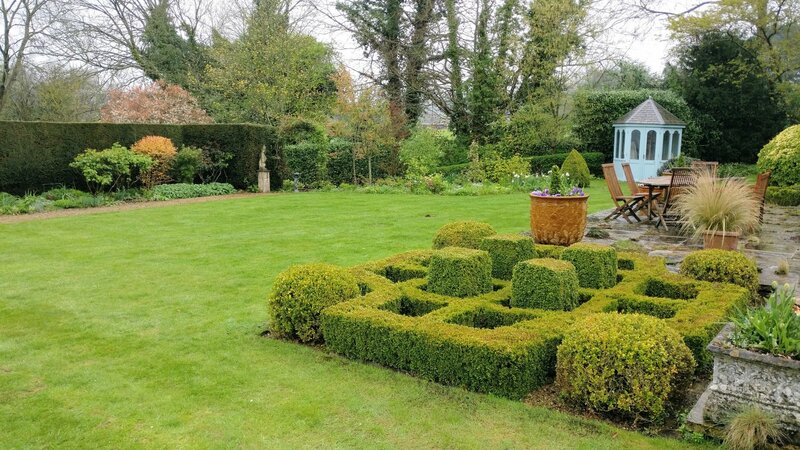 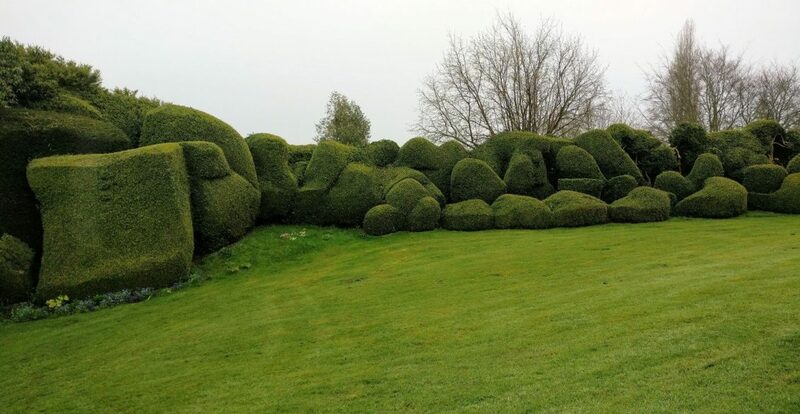 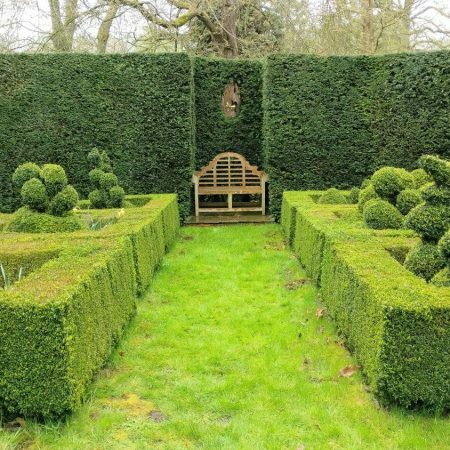 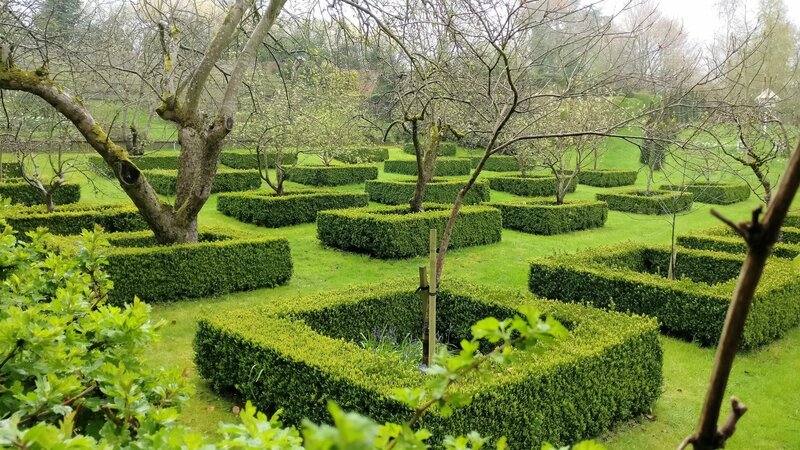 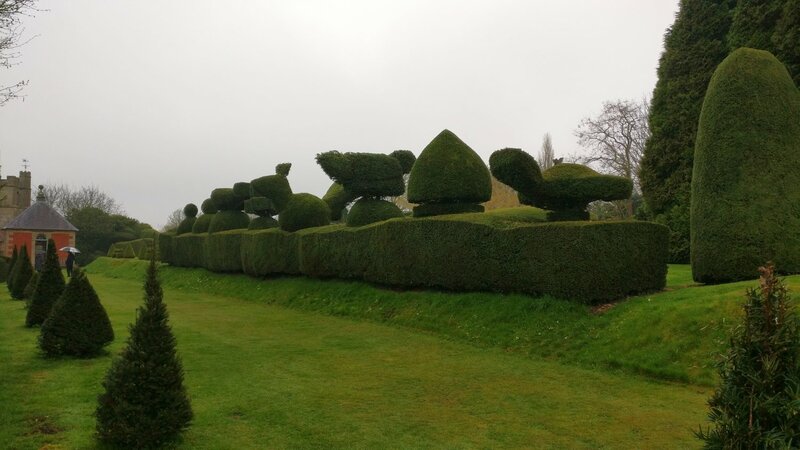 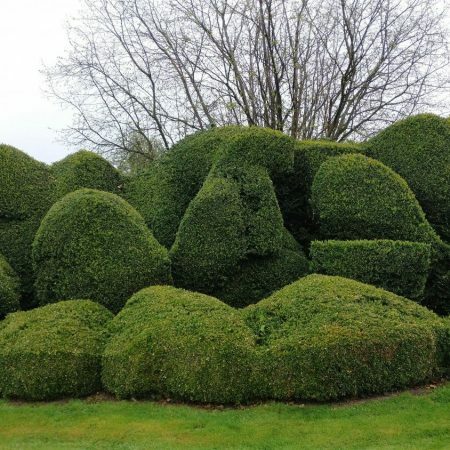 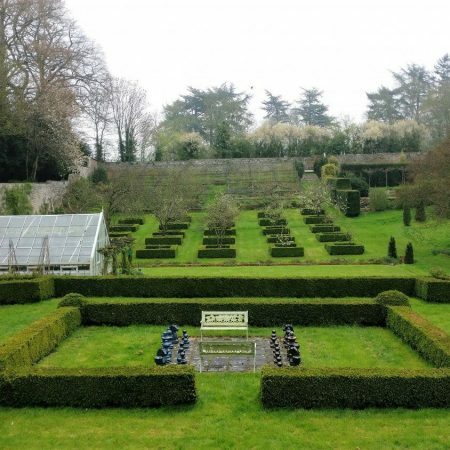 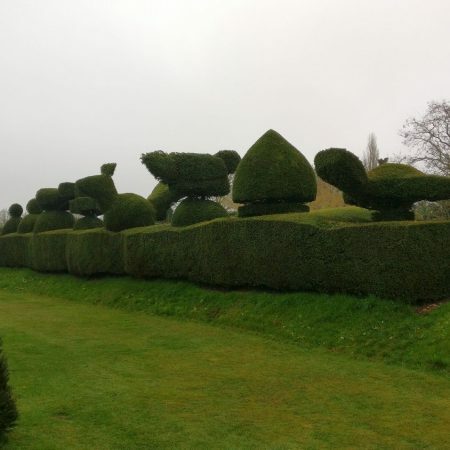 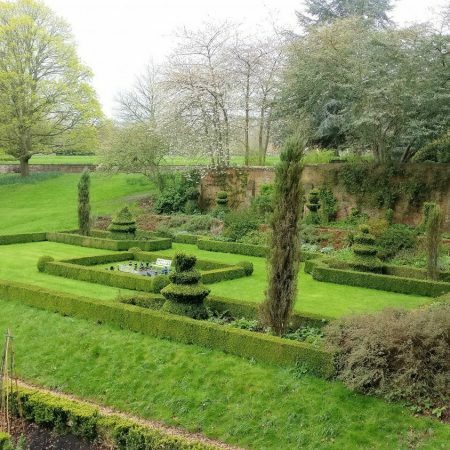 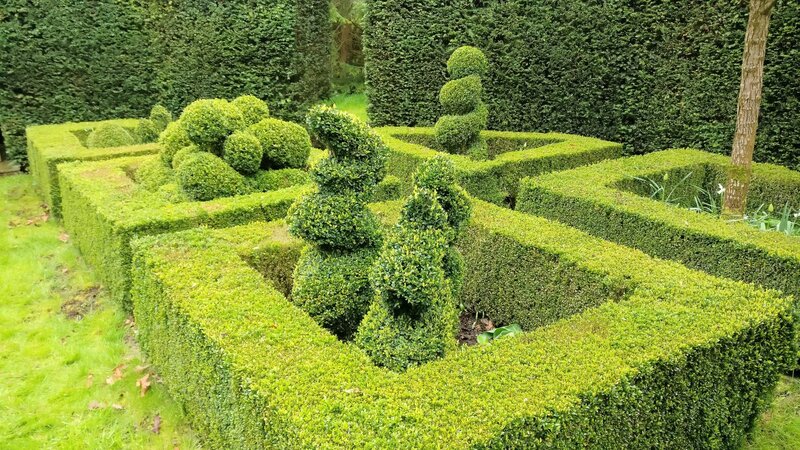 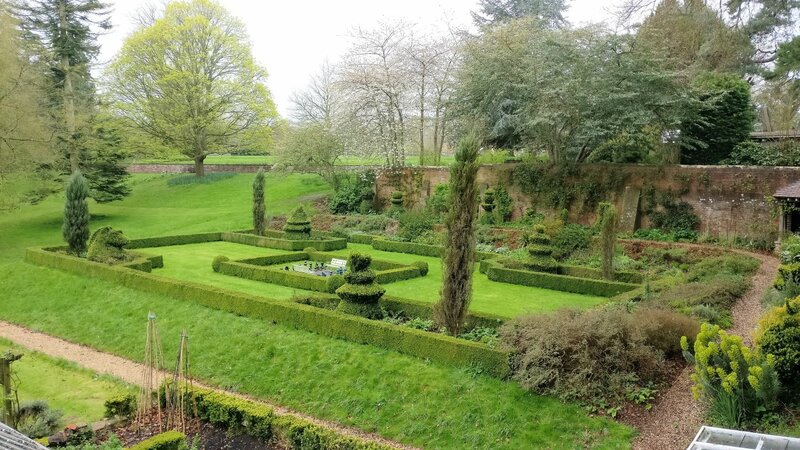 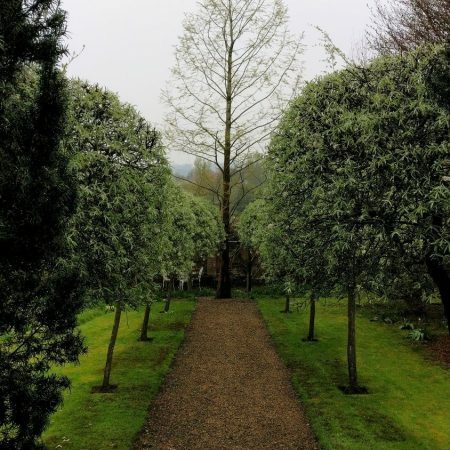 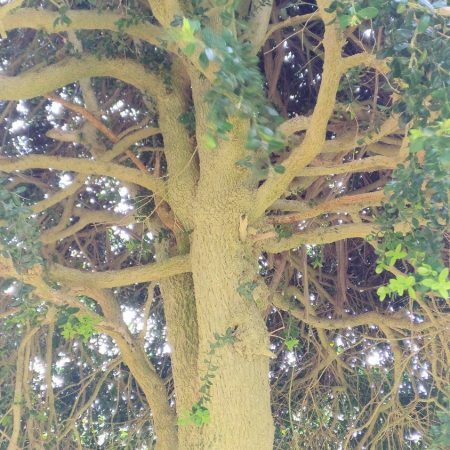 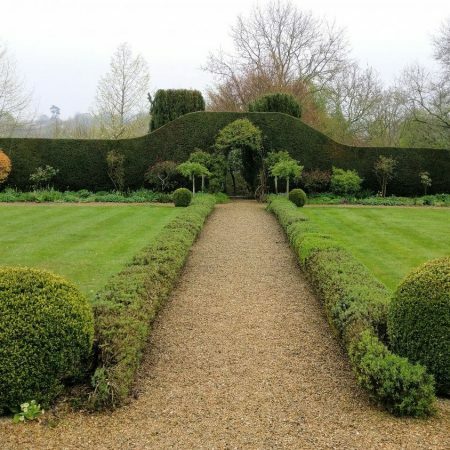 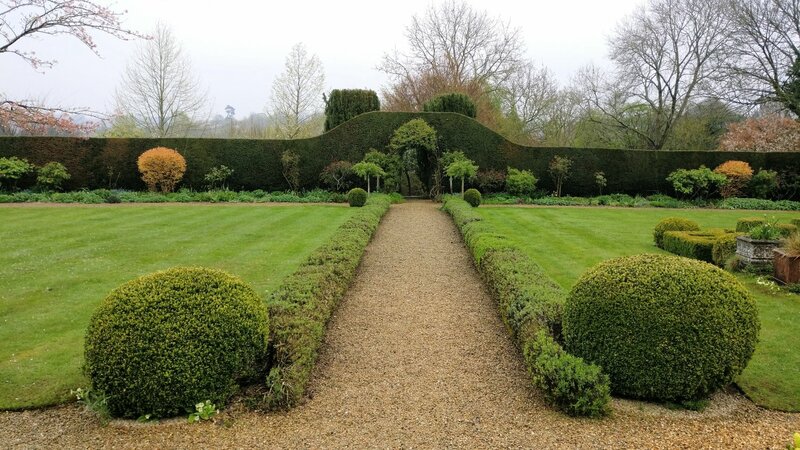 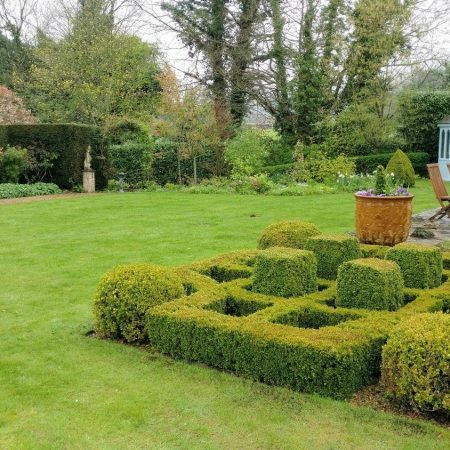 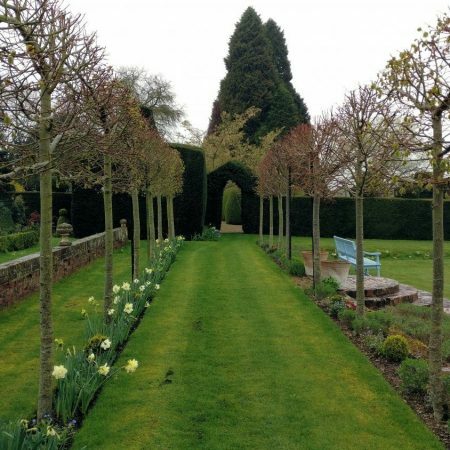 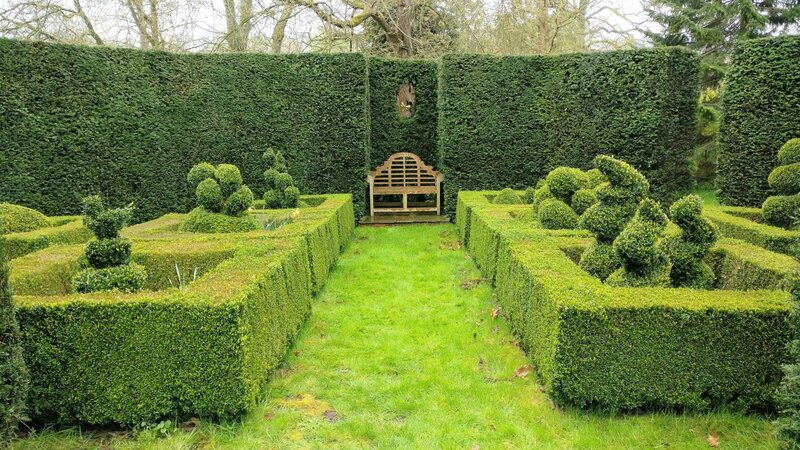 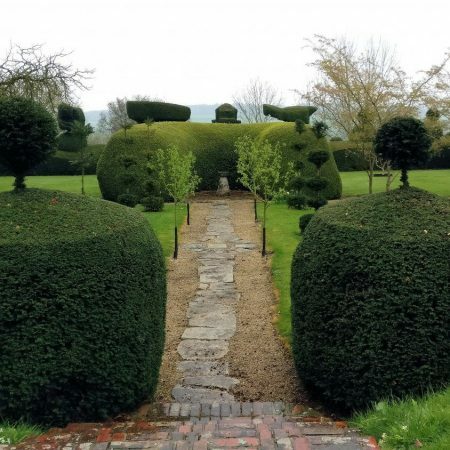 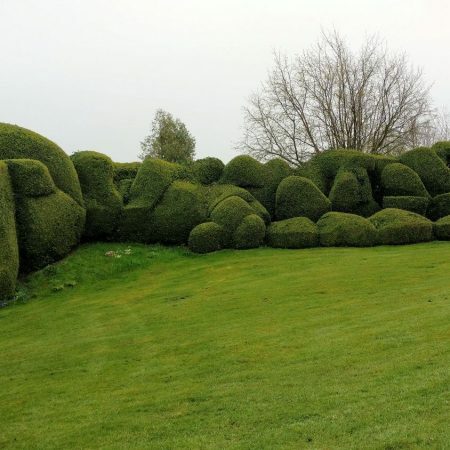 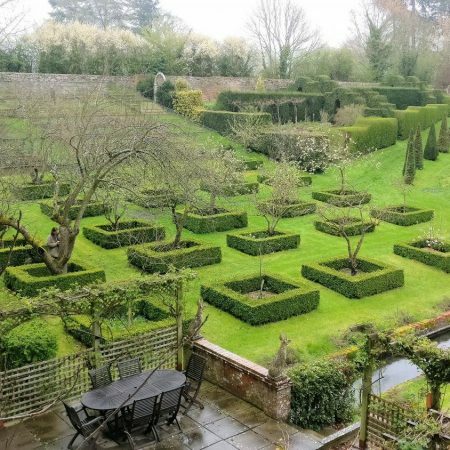 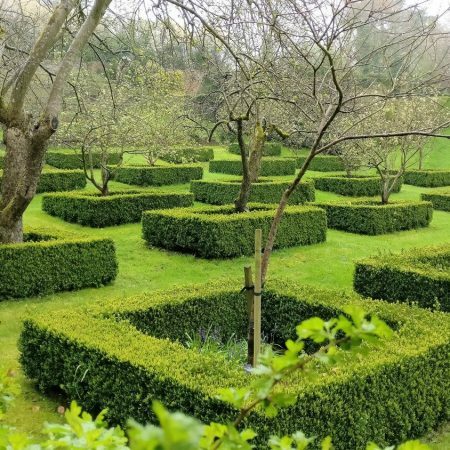 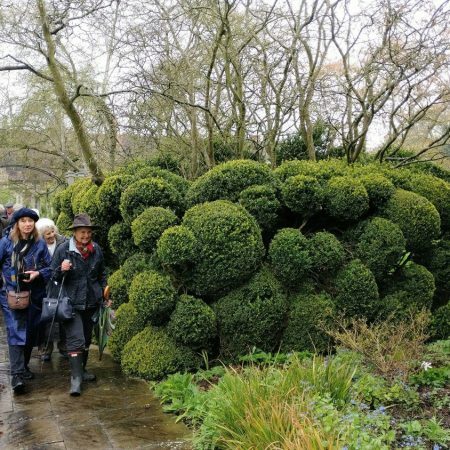 The garden at Court Hill House, Potterne has been lovingly designed and divided into areas by creatively placed and shaped yew and box hedging. 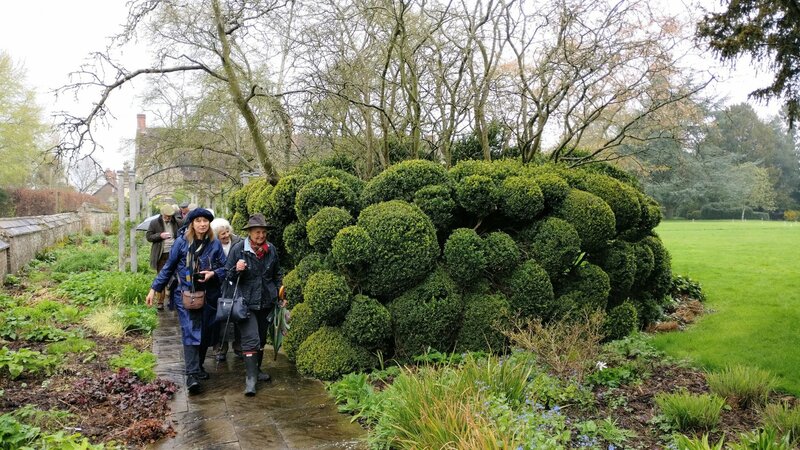 To send us on our way at the end of the day we were treated to some wonderful tea and cake, before Janey’s husband helped push a number of members cars across a rather muddy patch in the arboretum. 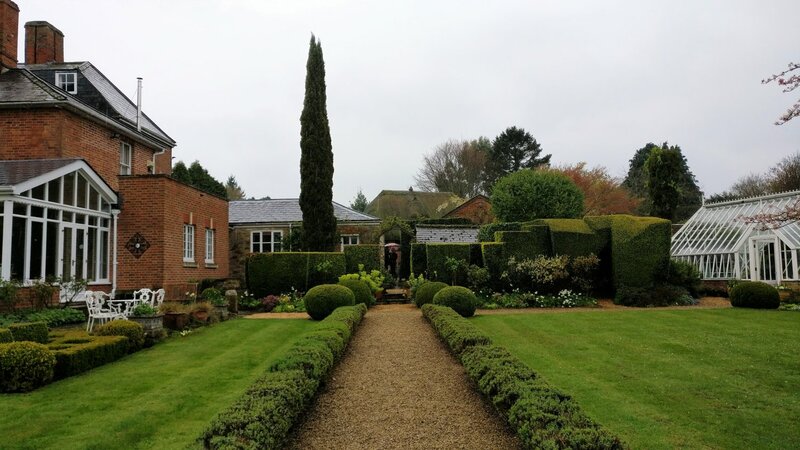 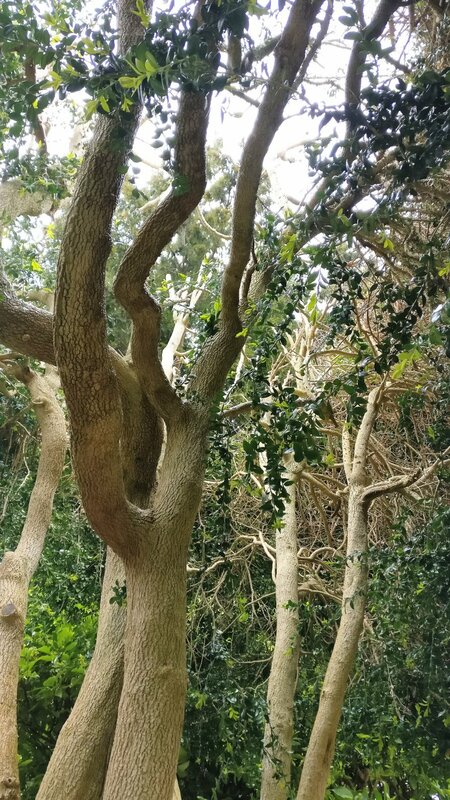 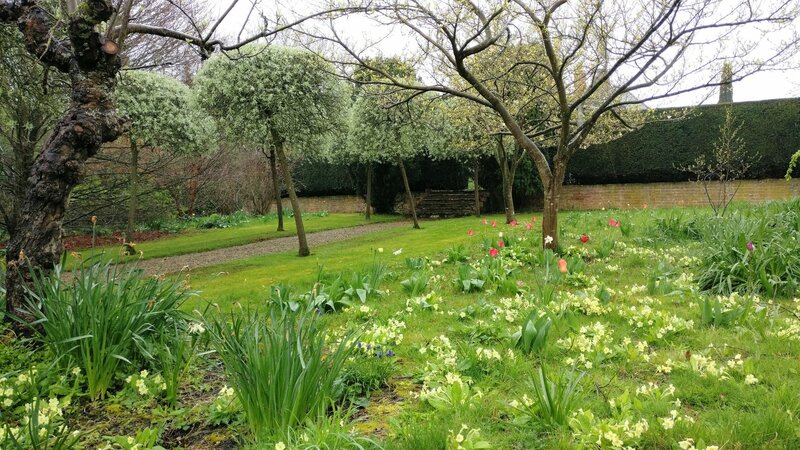 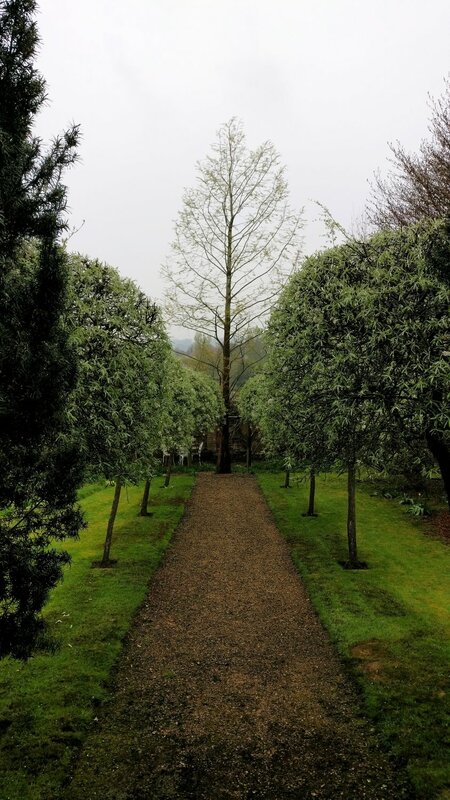 EBTS UK would like to thank Lady Nutting for arranging this trip and also thank the garden owners for the time, hospitality and letting us visit their wonderful gardens.